Coast to coast, though there are thousands inspired to dig in and grow food, but it is currently only a dauntless few who manage to gain access to the land, capital, market-savvy, and technical skills that are essential to “make it” as a farmer. Those few are brave, strong, and delightful advocates of the purposeful life, but it will take more than a few to reclaim a food system of industrial monocultures, labor abuse, and factoriesIndeed, it will take the muscle and heart of a large-scale, young-farmers movement: thousands upon thousands of hands on the land — the hands of women and immigrants, the hands of fourth-generation farm kids, the hands of college graduates and former farmworkers-turned-farmers. It will take thousands of new growers of fruits, nuts, vegetables, grains, dairy, and livestock to transform the landscape of sprawling development and corporate control into a dignified, livable, and culturally rich mosaic of ecological farming. 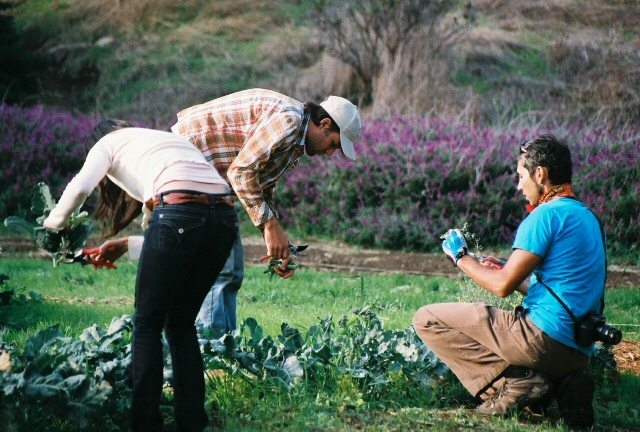 The young farmers now emerging seek to reclaim, restore, and resettle not only the deserted rural towns of America, but also to revive the fabric of urban life with markets, gardens, bees, corn patches and waterways. Motivated by a force of intention that cannot be rationalized economically, with lives driven by an instinct for direct action and stewardship that honors the planet, people, and place, we are the allies of every American. Our instincts are emboldened by the mercury shatter of dew on the broccoli plants at dawn, by the roar of pollinators in a flowering crop of buckwheat, and by the river of neighbors streaming through the farm-gate clamoring for “real” tomatoes and happy chickens. The hands of young farmers on the land seek to push forward an agenda of sustainability on a human scale. There is much to learn, and there is much, as a culture, that we risk forgetting. We need these bodies, we need their work, we need their food and their protagonism. We need young farmers to succeed. Incubator farms to rear and train fledgling farmers and an Agricultural Journeymen program to help people navigate the path from aspiring farmer to successful new farmer. Improved state-sponsored nutrition programs for at-risk, elderly and civic establishments. Start-up grants and an expansion of Individual Development Accounts, matched-savings program for qualified young farmers, to afford irrigation, tools, equipment, fencing, land, production infrastructure, etc. And what is success? Success is an edible future, when local populations are fed by local fields and sensible nutrition is affordable and accessible. Where we address poverty and hunger, not with biotechnology, but with long-term access to the means of production, and with proximity to that productive plenty which we can achieve only with careful stewardship of our soil and land base — a wealth immeasurable in dollars. Success is a smooth energy transition, a satisfying daily bread, a culture in which we have restored honor, and respect to the profession of farming. Arms strong and hands calloused, eyes open to the beauty of every morning, spirits prepared for the long row still to hoe, hearts full with the support of family and community, let us unite, young farmers, and fight for the right to farmable land, the pursuit of an equitable marketplace, and for recognition from society that we are here, indispensable, a cornerstone of our food future. Let us welcome many new entrants into agriculture, striving to share our lessons, seeds and stories with generations to come. Now is the time for action.